PM offer to help solve Iran's water crisis, launches Farsi website with plans for water recycling. 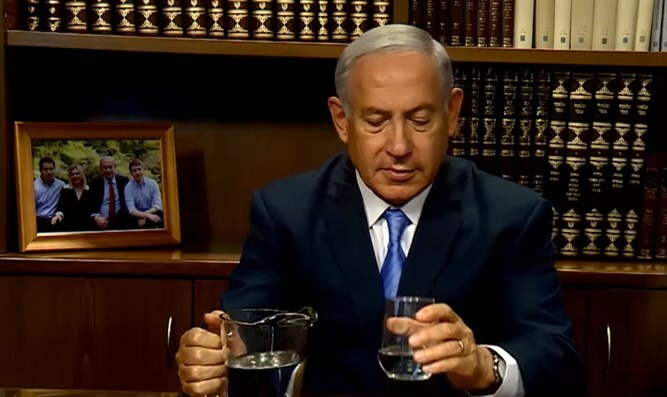 Prime Minister Binyamin Netanyahu released a video Sunday in which made an "unprecedented offer" to the Iranian people to help solve Iran's water crisis by creating a Farsi website with detailed plans on Israeli water conservation technologies and strategies. He noted that "Iran's meteorological organization says that nearly 96% of Iran suffers from some level of drought" and that Iran;s Environmental Minister had warned that "50 million Iranians could be forced out of their homes due to environmental damage." Netanyahu said that Israel's experience in dealing with its own water challenges puts the Jewish State in a good position to help Iran overcome its water crisis. He announced that the Israeli government would launch "a Farsi website with detailed plans on how Iranians can recycle their waste water."